Have fun sewing this 12" square flower basket quilt block pattern. The flower basket block is designed with lots of half square triangle units that you can sew in a theme or by using your leftover pieces of fabric to make a scrap quilt. The color and color value layout shown in the illustration is only one example of a potential look for the basket block — switch it up to suit your tastes and available fabrics. This Flower Basket quilt block was first used in the Scrap Happy Sampler Quilt. **The 2-7/8" squares will be used to make half square triangle units (HSTs). Cut them slightly larger than necessary and then trim your completed units back to the correct size to improve accuracy. Alter cutting for half square triangle units if you change construction methods. Try the Magic 8 technique to make identical HSTs in groups of eight. Pair a dark 2-7/8" square basket handle square with a background square of the same size. 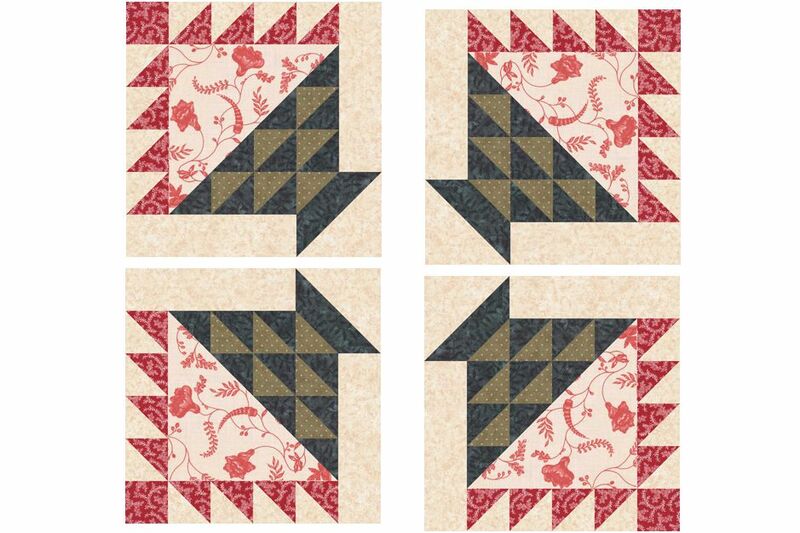 Use an easy quick piecing method to create two half square triangle units (HSTs) from the pair. When complete, each unit should measure 2-1/2" x 2-1/2". Repeat to make a total of (8) 2-1/2" x 2-1/2" red/background HST units. Set aside. Cut two of the black (or darkest) 2-7/8" basket base squares in half once diagonally. Set aside. Use the HST method again to pair a 2-7/8" black basket base square with a contrasting base square of the same size. Repeat to make a total of six 2-1/2" HST units for the basket base. Pair a 2-7/8" background square with a black square of the same size to make two HSTs that measure 2-1/2" x 2-1/2". Refer to the illustration. Use a scant 1/4" seam allowance. HST units can be stretchy so handle them with care and use straight pins to keep fabrics from shifting. Sew a black/background HST unit to the end of a background bar as shown, top left illustration. Sew the remaining black/background unit to the end of the other bar. Notice that the units are mirror images of each other. Press seam allowances towards the darker fabric. Gather four handle/background HST units and the 2-1/2" x 2-1/2" handle square. Sew them into a vertical row (first row in the top right illustration) taking care to arrange the angles as shown. Press seams toward the darker fabric. Gather the four remaining handle/background HST units. Sew them into a row as shown, just to the right of the first handle/background illustration. Notice that the triangles are mirror images from row to row. Press seams toward the darker fabric. Gather six basket base HST units and the four dark triangles created by dividing 2-7/8" squares. Arrange the triangles into four rows as shown, bottom left illustration. Sew the components of each row together. When you sew the loose triangles to their HST unit neighbors, their straight (bottom) edge will align with the bottom edge of the HST unit — the angled tip of the triangle will create a little "nub" along the top of the row and can be trimmed away. Press new seam allowances in adjoining rows in opposite directions and then join the rows. Press again. Find the triangle cut by dividing an 8-7/8" square and align it, right sides together, with the brown/black basket base. If the base is a bit smaller than the triangle, take it to the ironing board and press again to make sure all seam allowances are fully pressed. The two pieces must match in size. Left top illustration. Sew the pieced and plain triangle together along their longest edges. Press seam allowance towards the plain triangle. Sew the shorter red/background HST unit row to the top of the large triangle as shown, top center illustration. Press seam allowance towards the large triangle. Sew the longer red/background HST unit to the left side of the new unit. Press seam allowances towards the new row. Find the background bar/HST unit configured as shown in the illustration on the top right. Sew it to the side of the basket unit. Press seam allowance towards the bar. Bottom left illustration. Sew the 2-1/2" background square to the right end of the remaining background bar/HST unit as shown. Press seam allowance towards the HST unit. Sew the new bar to the bottom of the basket block. Press. Your flower basket quilt block should measure 12-1/2" x 12-1/2". If it does not try a few easy squaring up methods.